There is a very large community of people out there who are looking at various virtual world projects. Many of these people were part of the 2006/2007 (and before) Second Life explosion that I feel a particular affinity too. If it was not for all that I would not be doing what I do now in quite the same way. So I take a keen interest in any interesting projects in the space. So it is interesting when people ask if Second Life is dead, meaning are virtual worlds dead on the basis that they don’t hear wild and wacky stories about them in the press quite so much as its all Facebook and Twitter. However, the industry is gathering itself and the movers and shakers, new and old are creating interesting things. One such project is a new mirror world project. This one is from Jon Brouchard of ArchVirtual He has been around a while and is a name many will recognise from his architectural approach to virtual environments. I noticed on the Kickstarter a project by him called Main Street MMO cities in Realtime 3D and so I backed it. Mirror worlds, replications of real places, have a specific set of challenges in gathering and recreating the physical world, however it was not that problem space that interested me. It was that this one is to be built in Unity3d and hence has the chance of being a very accessible platform. With such a keen interest in Kickstarter at the moment it seems wrong to not invest in a virtual world project on a platform I have a lot of time for by someone whose work we know is of great quality? In many ways Kickstarter is an entrepreneurial busking on the street corner, getting small change for your talents but hoping to get enough to make something bigger happen. The fact this project is actually making street corners has a wonderful symmetry to it. 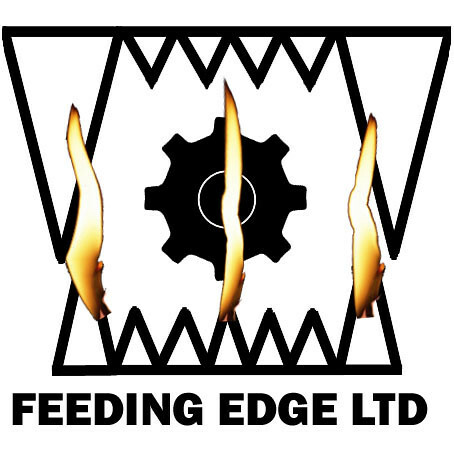 It is now, amazingly, 3 years since I started Feeding Edge ltd. Three years out of the relative cozy confines of corporate life. Note: That’s cozy in the sense that there is a structure, I am not suggesting anyone has it easy there. I spent 20 years in mainstream employment at IBM and I have now spent a fair amount of time acclimatizing and adjusting to a lack of structure. Oddly it was that structure and it’s positives and negatives that powers a degree of invention and skunkworks with many of the more sparky people in the company (or any company). Out in the rest of the world there are different combinations of structures there to work around, to adjust and flow with. They are just not always so obvious. What has not changed is my attitude to helping people and to the technology, and just doing the right thing because it needs doing. If anything this has grown with a bit more freedom to explore and express ideas. I do still suffer from the diversity of things that I get into with Feeding Edge. I was asked at a conference yesterday, after I presented, what I do with Feeding Edge. It is still the case that with this vessel I am “Taking a bite out of technology so you don’t have to”. Most of my practical technical architecture, design, coding, presenting, funds raising, inventing etc is going towards an ever growing game related project as part of another startup. The ideas within that I still find amazing in their reach into social media and games and really it just needs a few more people focussed on the specifics of all the bits I ended up inventing. Which comes back to ongoing funding and buy-in to the project. So in many ways that is the same as many projects people have in corporate life, looking for backers, support etc. Another major strand for me this past year has of course been the Cool Stuff Collective TV show. Presenting, and working on creating the pieces with Archie Productions for CITV/ITV has given me a strand of content to take and talk about in all sorts of places. I have been very proud of the content and of the subjects we covered for kids and I now use those threads to try and inspire more kids in to tech at other events and conferences, whilst at the same time relaying the story of how we make that to adults. This also time informs them of some of the tech they may not have been aware of, but not in a head on way as it is about kids and a TV show. So the question is how does this all move forward? Another year ahead. I do occasionally look at job adverts, knowing pretty much that any job I took could get incredibly enthused with and maybe make a little bit of a difference. Not just tech ones either as I have developed a lot over the years in working with people, persuading, leading, mentoring and educating. All the technologies I share and talk about are about people and also about huge economic and social changes to come. Tech jobs are usually know version x or y, but there is so much more to be done. I have yet to see a role that fits all the things I do with Feeding Edge, which makes me think either I have some sort of Unique Selling Point in diversity, or I should forget being a polymath and just focus on one thing. It is not the case that I have no plan, but my plan is to carry on doing whatever it is I do. It really does not matter that it is hard to clarify and comparmentalize, because I am out in a world of infinite opportunity. Trying lots of things, threading many of those things together so they support one another, building tech, talking tech, living tech makes it much easier than being one particular thing or one particular role. Of course all this comes at a cost. This approach, like starting brand new career strands such as TV presenting are back in the first rung of the ladder. That ladder being reputation, financial, etc. Stopping at any point, not doing a speaking engagement for instance, quickly erodes any building and levelling up that I may be doing in a particular industry, making new contacts etc. Conferences seldom pay directly, but the conversations lead to other things. The same as Tweeting and blogging are a “free” activity where you have to keep going, keep sharing to generate enough of a gravity well for someone to want to engage. “How do you find time to ….” well you just have to do it and weave it into life. I often reflect as I hurtle from event to event that it is like being a touring rock band before the huge record deal. You play everywhere and anywhere that people will listen. Writing those killer tunes, practising the art. Which in the end is the most important thing. Though you dream of a stadium gig and a number one single. So in the ups and downs of finance I have to say a huge thank you to my wife Jan (@elemming). She left IBM too, but only a few weeks ago and took up a fantastic opportunity based in London. It took a lot to leave after an even longer time than I spent there. It was worth it for the change and the impact she is able to have. Wherever you work you will start to be taken for granted eventually however good you are. If you are reading this and think, we should get him in to talk to us, please do 🙂 If you are reading this and thinking there is nothing we need him to tell us and show us, well! you are exactly the sort of people that REALLY need me to come and help you. Also please take a look at the new TV showreel 🙂 if you haven’t already. This is all down to all the guys and girls at Archie Productions and John Marley in particular getting this show going and trusting me to do my thing for the 38 shows we did over the past year or so. Anyone who sees the conference and workshops I do will know that this all these things actually thread together to a bigger story of what the future will hold. 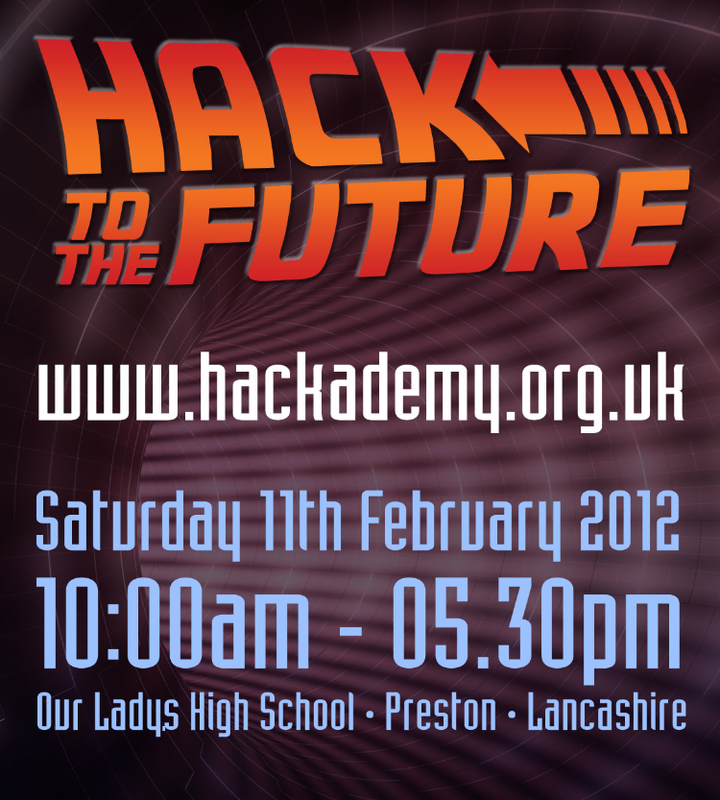 After a lot of driving I have safely returned from Hack to the Future in Preston. It was certainly well worth the trip to experience the energy and excitement of over 300 kids and 130 volunteers, speakers, parents and teachers gathering together to enthuse and learn about the world of computer technology. As I have mentioned, more than once, everyone needs to understand the technical revolution they are in the middle off. The implications of not doing so for industry, commerce, entertainment and life in general is just too huge to explain. What this gathering showed was that the facets of technology to get involved in, to use and explore are many and varied. It is not a question of just becoming a programmer and sitting in front of a keyboard. There are many more opportunities out there to fit peoples individual creative talents as they grow and evolve. I think I would have been there anyway, but with my Cool Stuff Collective super g33k hat (or rather tshirt) on and the subjects I covered in the 38 or so shows this diversity of interests and skills, plus some linking together of the arc of what I talked about on kids TV fitted rather will with aims of the gathering. 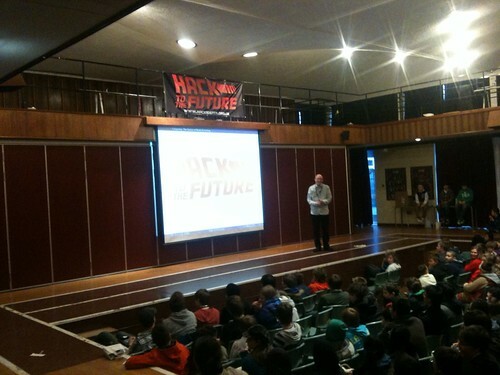 Teknoteacher (seen below) was the spark for Hack to the future and then a great rallying of many key organisers and doers piled into. Being an unconference the agenda formed on the day and a put my talk up twice on the board. Once in the main auditorium and once in a class room setting. The latter worked better for various reasons and ended up in a packed room. However it is always good to be able to share some of this stuff and I was pleased that at least half of each audience had seen the show. 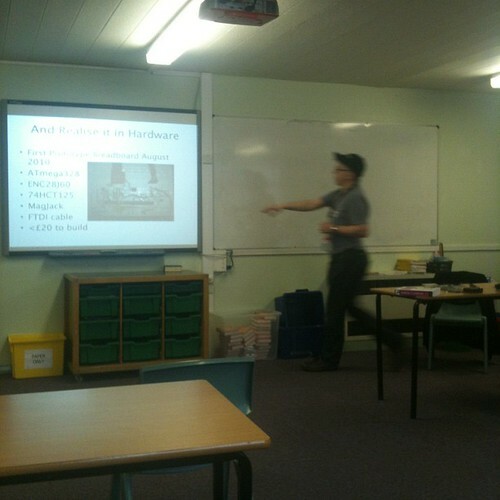 I was also really pleased when I mentioned Forza4, Skylanders and Minecraft that the audience in general already knew the basics of what it was I was talking about, which meant I could explain the much further reaching impact of things like 3d printers when taking in the context of these sorts of gaming platforms. I also cut a lot out of the talks as there is a more full hour+ version but we were working to 30-40 mins. Meeting and talking to many people from all over the place was great too. I am sure out paths will cross at future events related to this subject too. It was great it was a saturday with volunteers, but we all know that this sort of passion for the future and for science, with this sort of diverse options to fit with the interests and abilities of the community needs to be wired into education from the earliest days. There were a lot of very cool teachers at the event, passionate about making these changes. They were fellow evangelists but I am sure they also suffer the evangelist curse that the people in control over their time or budget have no idea why these people are doing what they are doing, until they have finished doing it when its so patently obvious they assume it was their idea in the first place. If it makes the changes happen its great but its a tough rough before, during and after. Many of the talks had kids completely captivated, there were a lot of practical hands on things like soldering and coding going on too. Freakyclown was doing a brilliant job of multiple talks on his pretty extreme ethical hacking and pointing out that they really should all get into tech in order to protect us all from the bad guys. Which he did by pointing out that he spent the first part of his career getting in trouble and using his powers for the dark side. As with many grey hats they have to have been there in order to have made the choices and gathered the skills to do what they do. If you get a chance to see him speak, or need to really understand whats going on out there persuade him to one of your events. Whatever you do for a living, whatever industry the things he talks about will affect your lives. The presentation I talked through was pretty much the same as the vienna one last week (or most of the ones I do at the moment) in slides but the conversation and tone went to some different triggers. Mainly telling kids to keep playing games because experiencing them and using all the features of them start to turn you into a maker and builder. With Minecraft being a typical example. Eyebeams was kind enough to post a quick interview we did capturing why the event was important. The closing keynote was the very eloquent Dr Tom Crick, Senior Lecturer in Computer Science at CMU; Leader of @CompAtSch in Wales. He tied it all up by reminding everyone just ow important computers are, how they impact every aspect of your life and how the traditional geek image is not really that accurate anymore. (Something I try and play with as G33k on the TV, claiming geek back and showing its about sharing and showing the technology not just insular technobabble and lacking social skills). It was also good to be travelling up with Andy Piper just after his big resignation from IBM after 10+ years. A fellow eightbar originator we share a lot of the same ideals, ideas and history in the expanding tech world. Andy was coopered into being crew at the event as well as organise and run the Nanode session which is a derivative of Arduino. 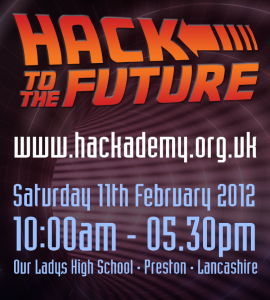 It is Hack To The Future, an unconference style event being held in Preston. Andy piper,recently liberated from the old firm and I are driving up today ready for an early start on Saturday. You can tell that we are all keen as for us Preston is a 260 mile drive up into that north west of England. Quite a trek. There are people coming from equally far a field. I am sure we will all blog and report on proceedings too, assuming we don’t get snowed in! Back in June last year I started using my Xbox and Kinect sensor with physical fitness in mind. So to all intents and purposes I was playing a game, as the blurb says, with my body as a controller. This was the UFC Trainer. UFC is a mixed martial arts championship that has spun off a lot of franchise activity. It started as cage fighting, pitting extremely well trained and tough fighters in various styles against one another. Nothing virtual about that. However, as with many things it has spawned traditional fighting AAA games titles. Which is a fairly normal path. What is more exciting though has been the move to create the personal trainer that you interact with by actually performing the exercises. This is not really a game, it is a rep counter and technique tutorial. Standing in front of the kinect the system will ask you to start throwing hooks or crosses, knee kicks etc. It looks very roughly at your form and counts and shouts at you to meet the rep target. It is not all fighting though, traditional push ups and dumbbell exercises, squats, lunges and holds. To avoid the boredom you may get from a video/DVD style exercise this is of course able to be a bit more dynamic. 30,60 and 90 day programmes in weight loss, endurance or strength provide a ramping up of lots of different styles of workout that are also adjusted by your fitness level. This turns out to be a doubling of reps as you step up in the fitness test it gives you, but it feels much more varied. So whilst this is a “game” on a “game console” and isn’t real contact fighting it is a very rigorous workout and with the graphs and stats it tracks for you it feels very comprehensive. The effects on your body are very real especially after a few months sticking with it. The other thing it has built-in is sharing with social media, however it never worked very well as the website, like many game websites is pretty appalling, looping registrations, lots of region specific switching etc. So I let Raptr fill in my activity on Facebook. So this game to physical activity started to feel part of life and my youngest (predlet 2.0) started to ask about having a go with the kinect to do exercises. I felt he was a little too young to do this on his own and that we would be better in a real martial arts class, with his peers and an attentive instructor. Doing any exercise, developing bad form and habits can do lots of damage! Then, serendipity kicked in, a leaflet appeared at school for the fastest growing martial art in the world the Korean inspired Choi Kwang Do, and a new school opening around the corner. I didn’t know much about it but it clearly was aimed at both adults and kids to do physical training in a practical sense but without the direct competition of combat. Still lots of hands on kicks and punches though. So we went along to out trial lessons with SouthcoastCKD and I was immediately taken by the style and the ethos. Predlet 2.0 seemed to like it too. Being abel to train together at a family session and also I get to go to adult sessions as and when I can makes this ideal. I had wanted to do a martial art since I was about Predlet 2.0’s age but had never actually taken the plunge. Now, the xbox training since June in mixed martial arts and general flexibility and fitness has inspired me to level up to a real class. Of course this is a nice circular story in that now when I train on UFC kinect and will start to adjust the style to that of CKD, as none of the strikes are lock out punches. The Xbox will not really worry as it does not try and get precise form, only counts the general action. Back in the olden days, well a few years ago, I helped talk to some MBA students from Warwick University about Second Life and its potential. In fact the entire UK crew at the time got involved in this as the Warwick business school is well respected and the team we talked to were very switched on. 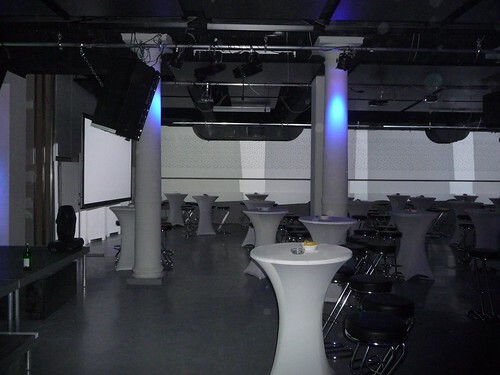 We presented in a nightclub environment. Lots of stand up tables dotted around and a packed crowd. We have a cool rear projection screen and a radio head mike for the stage. We had to fiddle around between one or two computers. 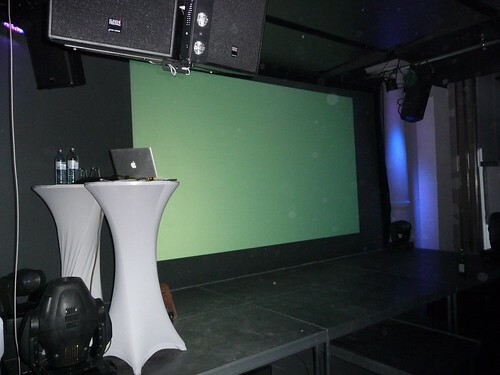 I usually present from my machine as I have live demos of Opensim and Unity3d and Minecraft, but instead I presented from Benjamin’s machine which meant a little bit of resolution change and keynote to ppt required. 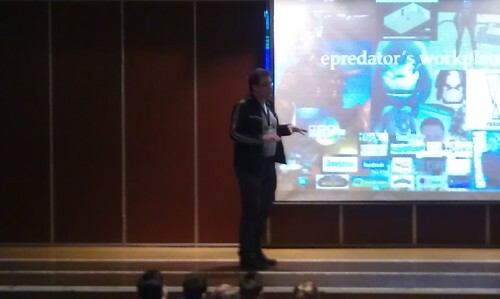 My fellow presenter Stefan Bielau went first as a mobile, apps and media consultant. He spoke in German, but we had chat before about what he was speaking about. Lots about the next generation of location awareness, about touch less technology too and how that fits into the landscape of the marketeer. Stefan is also well versed in startup land so we went and had dinner after the event and swap tales and worked out who we both knew of. He works out of Warsaw but is often over in London. I had a cut down version of my much longer presentation but the core feature was still the blurring of physical and digital and how maker culture spreads into lots of places from making cars in Forza4 to making reprap 3d printers that then print digital goods back to physical. It is still proving a rich and sup rising area for people as the feedback from the very large event crowd proved. For once I was not actually wearing my striped leather jacket whilst presenting, but I did have some “costume” on with the original Cool Stuff Collective g33k tshirt. I showed some clips form the show (which are the place holders in the slideshare version below). It is a real pity that my future tech pieces are not sitting on youtube or still available on the web as they make handy little story pieces that could be used in schools and colleges and also as a take away for conferences. As people could then listen and see about the tech at their own pace after the event. Oh well, digital rights is a complicated area. View more presentations from Ian Hughes. It was a great trip and it was nice to see a bit of a city I have not visited even though when I walked around at 8:30 am in -13c it was like a film set with no extras around. I have never seen a city so empty. In part because large areas are pedestrianised too so there we no cars zooming past. 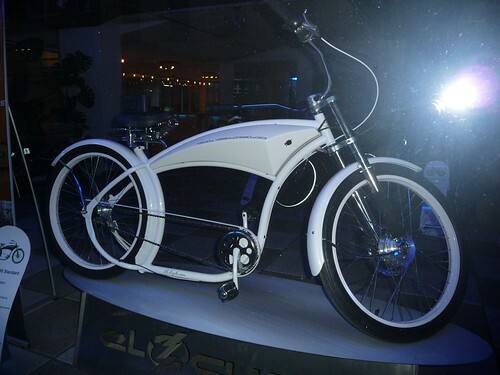 I did see a very unusual looking electric bike amongst all the cartier, gucci and tiffany stores too. I really enjoy sharing these ideas with people, and it is great that it does translate to any audience, from kids to adults from one country to another regardless of level or profession. Which gives me some encouragement that I am still on the right track working to help people invent their own future.